Alllll the pigments - click for larger image. Placed an order on April 30th, shipped on May 2nd, and received on May 5th! It only took them 2 business days to process and ship my order, which is very, very impressive considering that they were having a sale and it was probably pretty hectic. I received everything neatly packed in two tiny zipseal baggies, and received two samples. A tiny detail was that there was no invoice included with package, and no note - it doesn't feel very personal. When I shop with an indie cosmetics store, what makes me feel happy every time is that they always include a personal note, it makes me feel better about supporting a smaller business. This is really not a very big deal however, and would not be a dealbreaker for me. 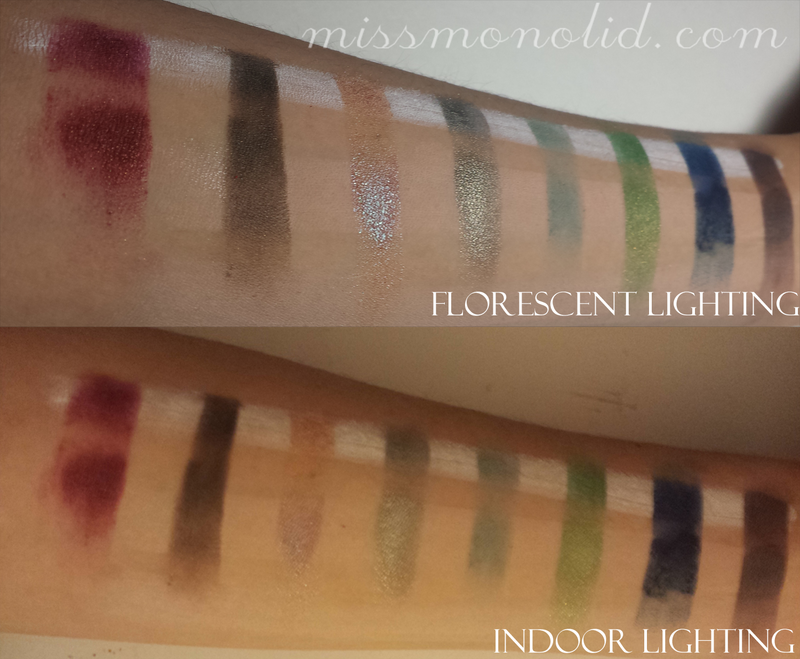 Swatches that are shown on the website are not true to how they swatch in real life. Dirty Mind is described as "matte light coffee brown", looks like a chocolate to me. Not really as pigmented as I like my mattes, looks good over NYX Milk (I kind of fudged the swatch over Pixie Epoxy), but doesn't really work by itself. 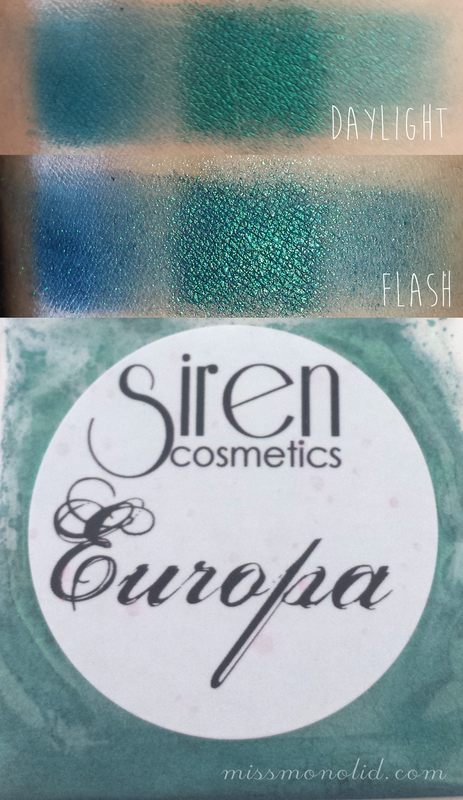 Europa is described as "a deep turquoise with green shimmer", it's one of the shades that drew me into the brand. 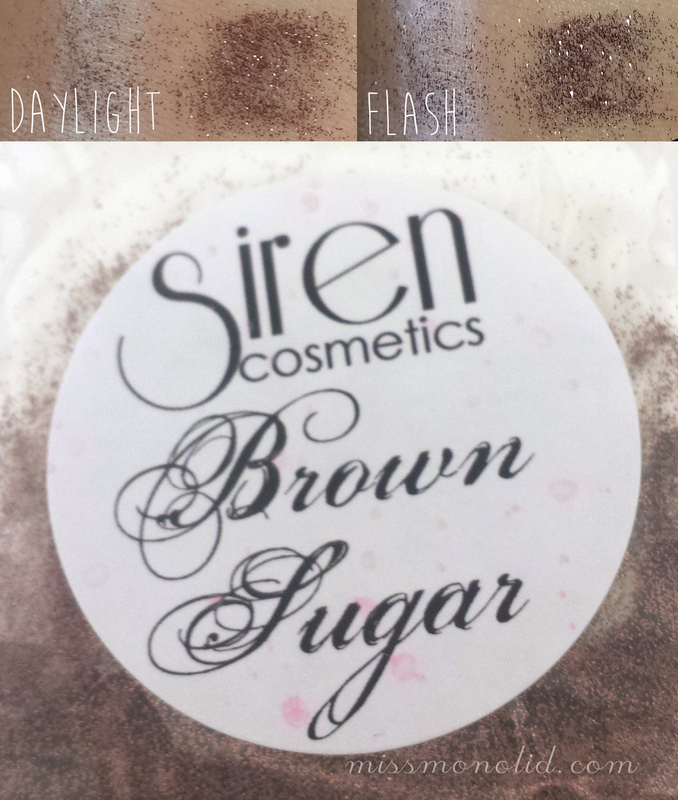 I really wish Siren Cosmetics sold minis, because I would definitely get a mini of this. 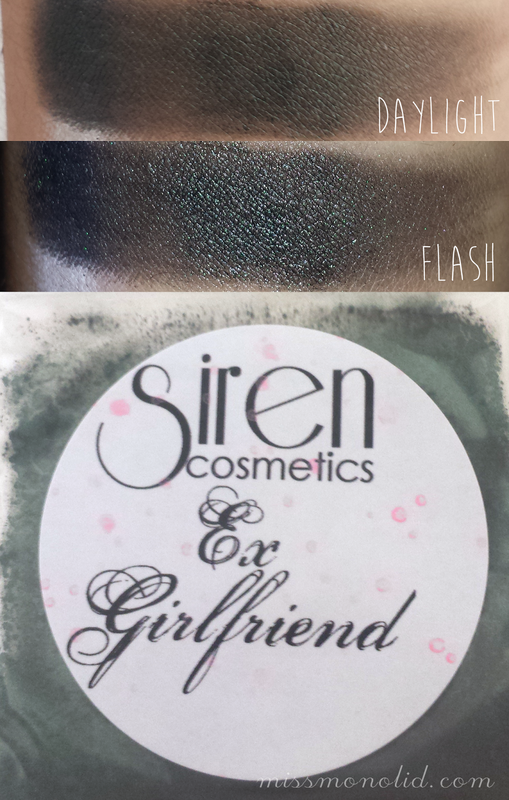 Ex Girlfriend is described as "black undertone loaded with an emerald green shimmer", I can barely see the green shimmer, even in the baggie and swatched over Pixie Epoxy. This shade had a lot of potential, but it just didn't work out for me. 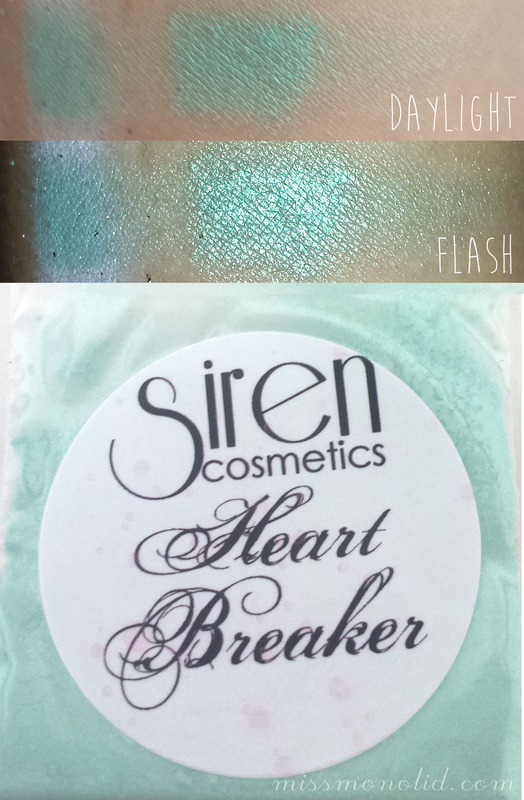 Heart Breaker is described as "seafoam green with bright green shimmer", it looks more like a slightly metallic mint to me, and I absolutely was not expecting to like this color as much as I do. The website swatch looks a lot more baby blue than what you actually get. I would get a mini of this. 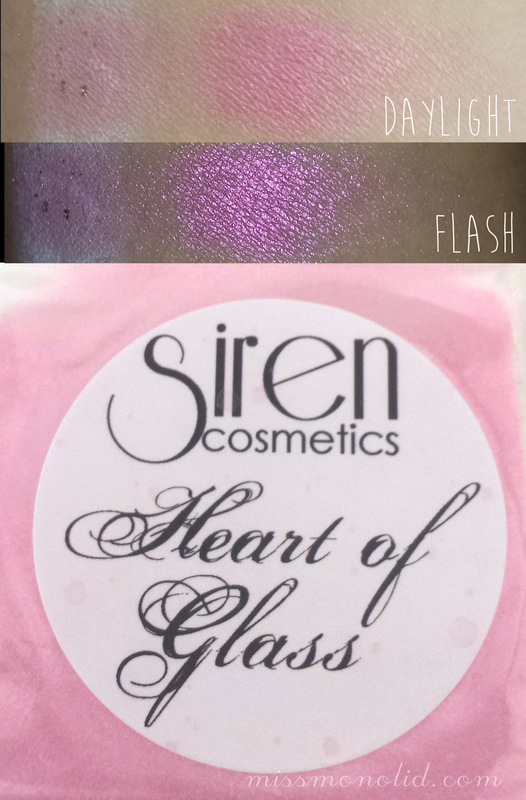 Heart of Glass is described as "light pink with a bold bright pink shimmer", despite not liking pink that much, I actually kind of like this shadow, maybe it's the pink shimmer that does it or something. 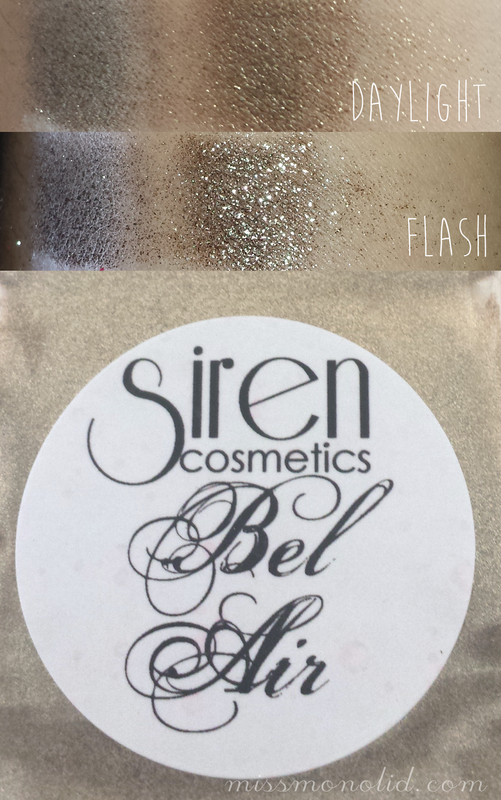 Bel Air is described as "super sparkly gold cosmetic glitter atop a deep brown pigment", I can easily say that this is my favorite out of the bunch. It's super glittery and beautiful and of course, it's the one they're discontinuing. Sad face forever. 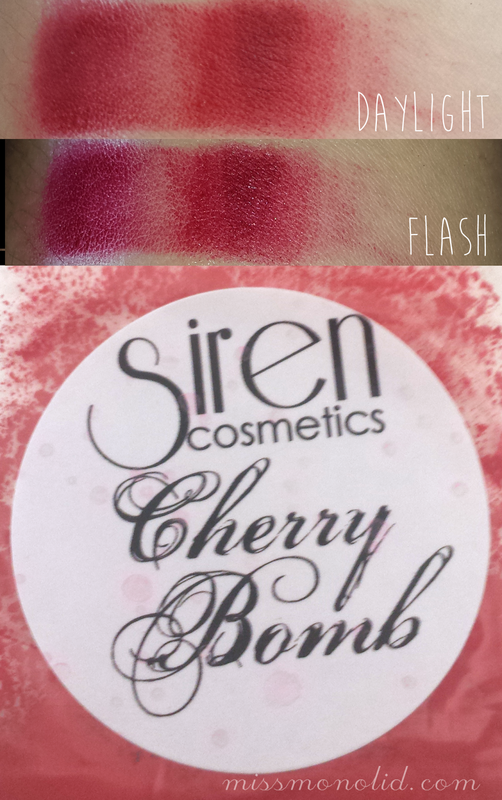 Cherry Bomb is described as "bright matte red, highly pigmented. staining may occur." I just can't figure out how to work with their formula. It is a matte red, doesn't look really bright to me and I have no idea how they managed to swatch it that well on the website. 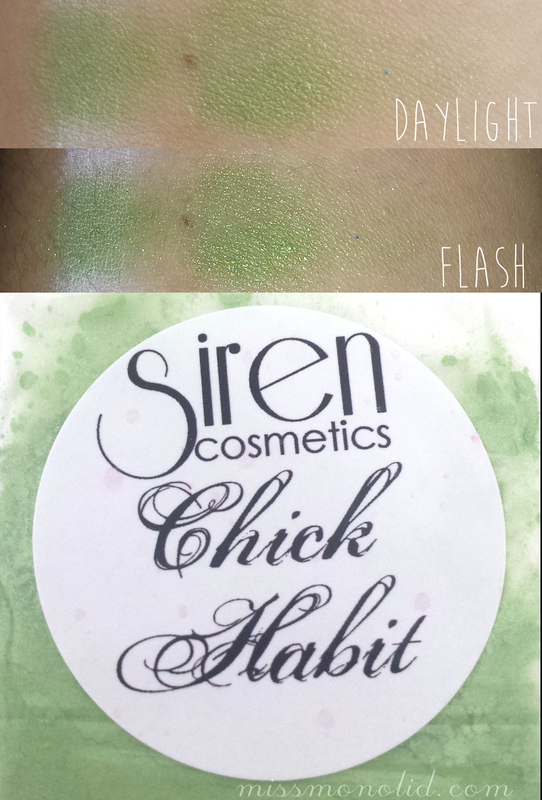 Chick Habit is described as "lime green shimmer with a golden yellow undertone", reminds me of Stripper Zombie from Notoriously Morbid, but toned down about 10x and with not as great formula. Not too impressed. 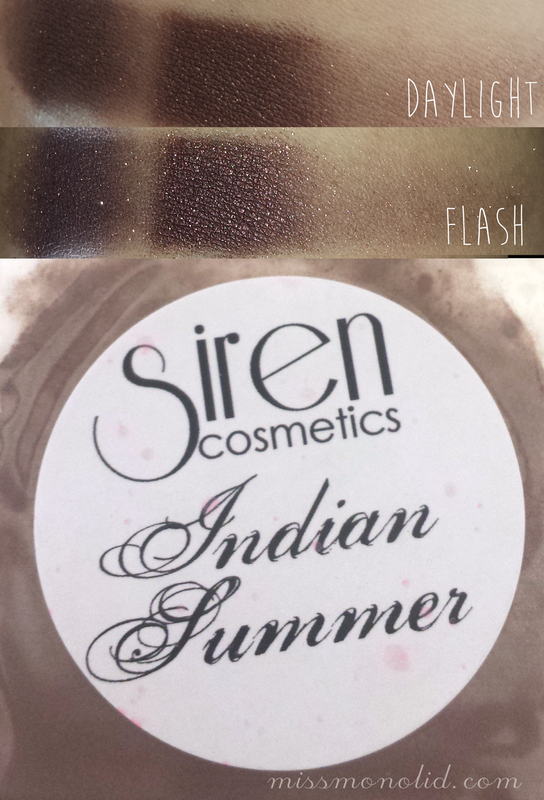 Indian Summer is described as "slightly reddish brown with a golden shimmer", it is easily the eyeshadow with the best formula in all the samples I got. It was very smooth and glided on super easily, again, doesn't really work with bare skin, but looks gorgeous over Pixie Epoxy and NYX Milk. I would buy a mini of this one in a heartbeat. Brown Sugar is described as "novelty use", it was one of my freebies and I have no idea what to do with this. I wouldn't purchase it. 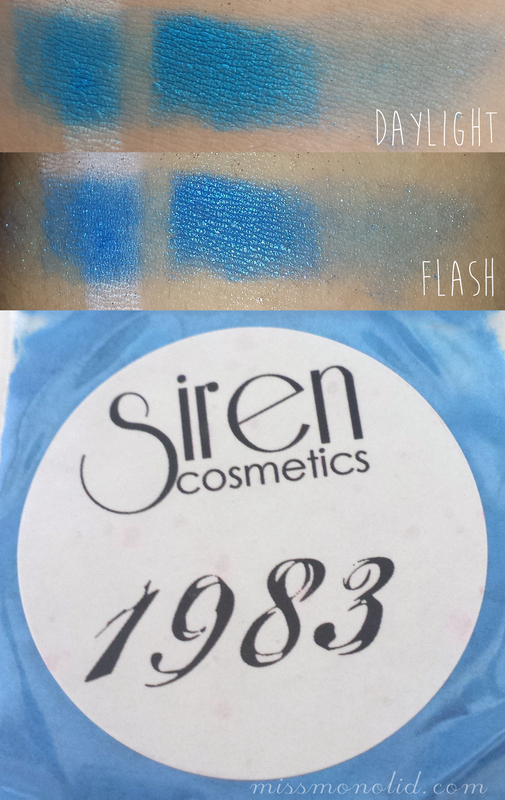 1983 is described as "an intense shimmer blue", my second freebie, and boy is intense right. It is this slightly shimmery electric blue is quite shocking. It looks like it would be on par with "Gonzo" from the UD Electric Palette, however I do not have the palette itself so I cannot comment on how similar they are. This also definitely needs some sort of primer to work, it doesn't play nice on bare skin. This color also stained my brush, even when I washed it right afterwards. Swatches all together, top NYX milk, middle Fyrinnae Pixie Epoxy, bottom bare skin. Click for larger image. Overall, I'm not impressed with the formulas of these hand crafted pigments as most of them would be unusable if not for Fyrinnae Pixie Epoxy or NYX Milk, I do however enjoy some of their more unique shades such as Bel Air, Europa and Heart Breaker. I would consider repurchasing from Siren, if they weren't discontinuing Bel Air. Disclosure: Unless otherwise noted, all products were bought and paid for by me. I do not do paid reviews, but will consider relevant press samples, all my reviews will be 100% honest and my own opinion. Beauty, Drugstore, Eyeshadow, L'Oreal Be the first to comment! 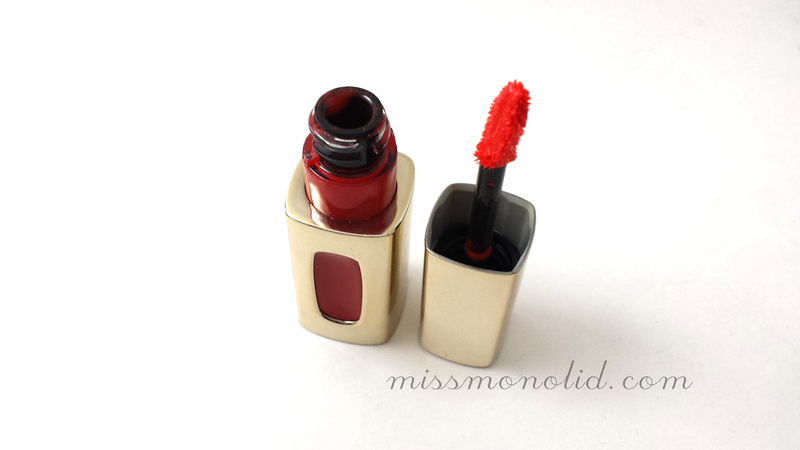 L'Oreal Infallible Eye Shadow in 340 Dive Right In & 343 Cherie Merie, click for larger image. 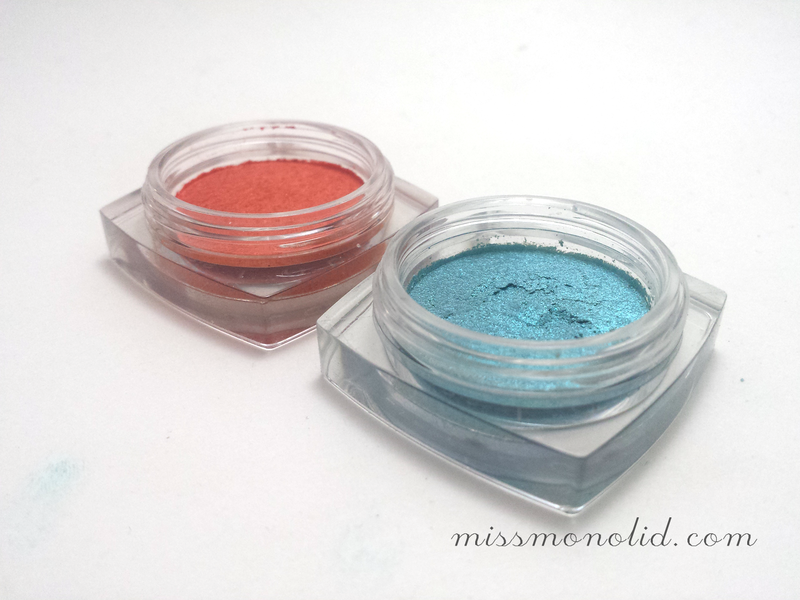 I've always been a fan of drugstore makeup, and these are no exception. L'Oreal Infallible Eye Shadows are priced at $7.99 for .12oz, which is rather standard for drugstore prices, but can be had for much cheaper during the weekly sales. I don't really know how to describe the texture of this product, it's very smooth, soft, and creamy, but it's also a pressed powder. It literally squishes down a little when you press them, which is weird, but cool. They're very easy to use with your fingers, and unlike most shadows, these don't necessarily require a brush for better application. I'm probably going to reach for these on my lazy days. 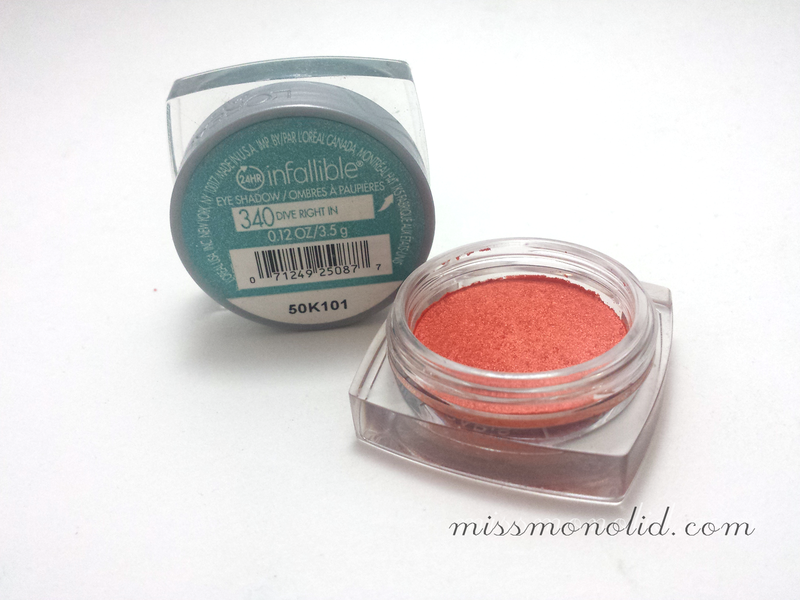 L'Oreal Infallible Eye Shadow in 340 Dive Right In & 343 Cherie Merie opened, click for larger image. On first glance, I thought that I would like "340 Dive Right In" more, it looked like such a beautiful aqua with a slight purple-ish shift, but unfortunately, it applied very sheer and frosty and didn't have as strong of a duochrome that I thought it would. "343 Cherie Merie" however, pretty much knocked my socks off. It's a beautiful smooth orange color with really nice pigmentation. Oh Cherie Merie, where were you when I was looking for orange eyeshadow last year? Swatched, Top swatch no base, bottom swatch with NYX milk, click for larger image. 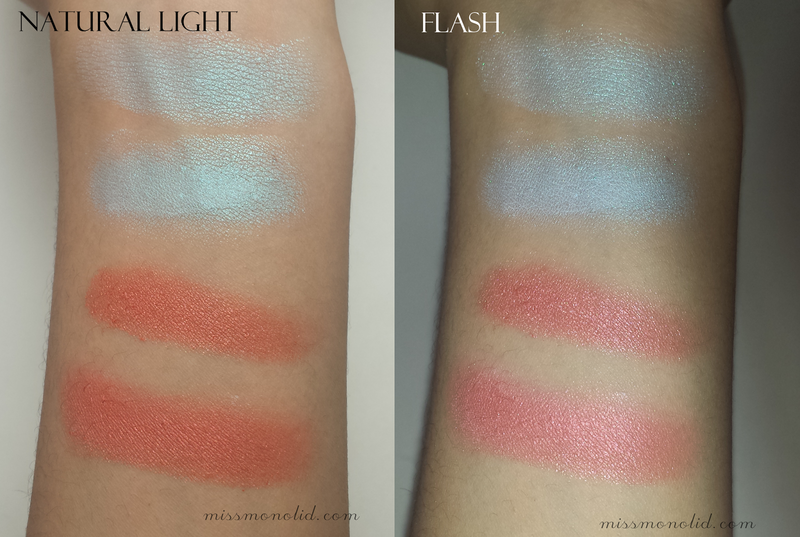 As you can see in the swatches, "Dive Right In" is very sheer, in the flash picture, you can see where the NYX milk was. The funny thing though, is that these colors seemed to blend with NYX milk instead of sitting on top of them, which can be useful if you wanted a frosty white with slight blue tones or a paler orange. These shadows, especially "Cherie Merie", are also pretty long lasting, I had trouble getting it off with water and paper towel and had to reach for my makeup remover. Gold star. Have you tried these shadows before? What are your favorite colors? Thanks for joining me today! Disclosure: Unless otherwise noted, all products were bought and paid for by me. I do not do paid reviews and all my reviews will be 100% honest and my own opinion. Charcoal Cleanser, Drugstore, Face Mask, Skincare Be the first to comment! 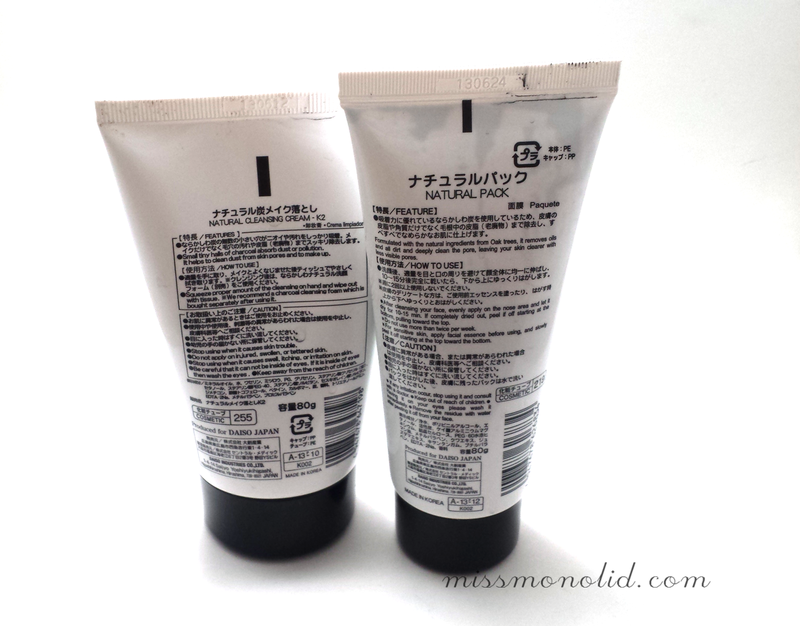 Daiso Japan - Cleansing Cream and Natural Pack - click for larger image. Charcoal cleansers are one of the hottest things this year, they're proclaimed to draw out impurities and trap dirt much more efficiently than basic cleansers. After seeing these two at my local Daiso, where everything imaginable is $1.50, I decided to pick them up to see how they fared compared to my current cleansers. Cleansing Cream and Natural Pack directions and description - click for larger image. At first glance, the cleanser cream, $1.50 for 80g, and natural pack, $1.50 for 80g (a peeling face mask), are very cleanly packaged and are marked "Produced for Daiso Japan". Cleansing cream used over swatches, a little of OCC Pretty Boy remained after first cleanse - click for larger image. The cleansing cream is light grey, very creamy, and heavily scented. I tested it's makeup removing ability on my wrist, where I had swatched OCC Pretty Boy, Maybelline Vivids Vibrant Mandarin, Urban Decay Ink and NYC White. 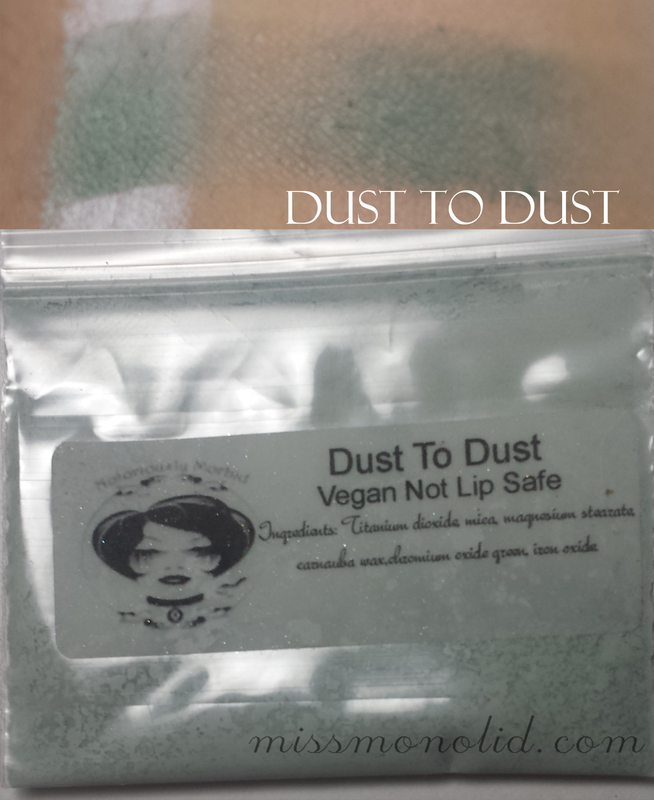 Most of the products were gone within the first cleanse, however OCC Pretty Boy left a lasting imprint past the first cleanse and the second cleanse. Although the cleanse felt gentle and left my skin feeling soft, I do not recommend this for anyone with sensitive skin as it is fragranced and is supposed to be followed by a second (foamy/soapy) cleanse. Natural Pack over wrist - peeled off, left my wrist a little red/irritated looking, alas, I didn't take a picture of that - click for larger image. The natural pack starts off very gooey and smells faintly alcoholic. It dries to a papery finish, and you are to peel off the mask afterwards. I also do not recommend this at all for anyone with sensitive skin. 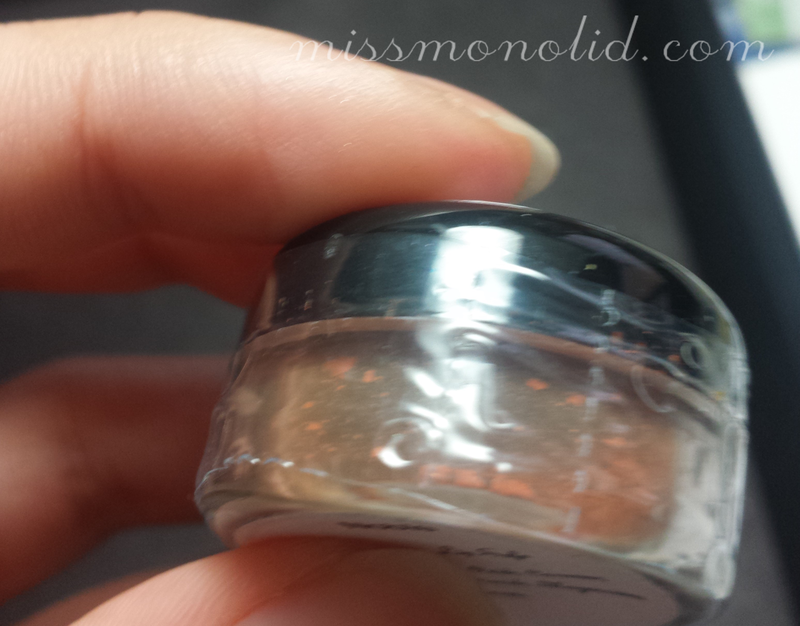 It left my face feeling quite raw and uncomfortable, I did a swatch on my wrist for the blog. I will not be using it again after this. 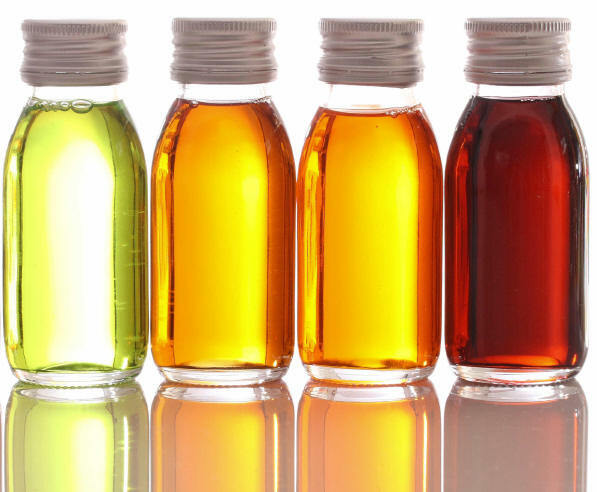 Have you experimented with budget skincare? Did you end up liking what you bought? Thanks for joining me! Entire haul - bonus candy and 2 sample baggies. Click for larger image. There are three things that I can never pass up: 1. Make up, and assorted pretty things, 2. Sales and promotions, and 3. Doctor Who paraphernalia. Notoriously Morbid, an indie cosmetics company, managed to combine all three of my loves in their celebration sale! I placed my order on 4/3/14, and my order was shipped on 4/14/14. The turnaround time that is advertised is 10-14 business days, and my order only took 7 business days to ship; this is really good for an indie company. 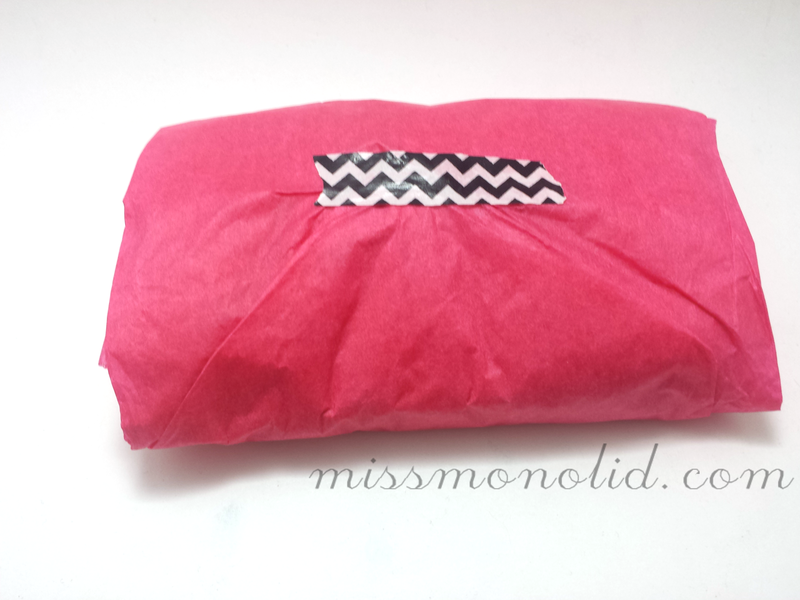 Came neatly wrapped in pink tissue and patterned tape - click for larger image. I ordered the beauty blogger package, The Doctor collection, and Jupiter Rain. With my order, I received 2 extra sample baggies, a handwritten note with my invoice, and a banana laffytaffy. All of the shadows are sealed with a shrink wrap - which I really, really appreciate, since not all indie companies do this. Something that I was a little disappointed in was the amount of shadow in the full sized jars. Full sizes are advertised to be "completely packed 5g jars" on storeenvy and on a couple of eyeshadows on website, but only one shadow seemed to fit that description. I'm not sure if this is an anomaly or if I'm just being too sensitive because I haven't been able to find a review/blog with full sized containers. I was also unable to find an example of how much product a standard full size should contain in the FAQ, but I did feel slightly cheated, since some shadows I received contained much more product than others. Sad half full container. Click for larger image. As an example, my container of Noble weighed 8.0g, whereas my filled to the brim container of Boe weighed 8.9g. I understand there is a slight variance between the weights of the shadows due to the different densities of the individual shades, (Vashta Naerada clocked in at 8.9g with about 3/4 container filled), but there is no other way, than the pictures that I took, to really show how much was actually missing. EDIT: Customer service is amazing. I contacted Carrie on 4/30/14 about the "half filled" container and she promptly responded and asked if I wanted her to send me new jars of shadow. Notoriously Morbid has A++ customer service and I am definitely going back. 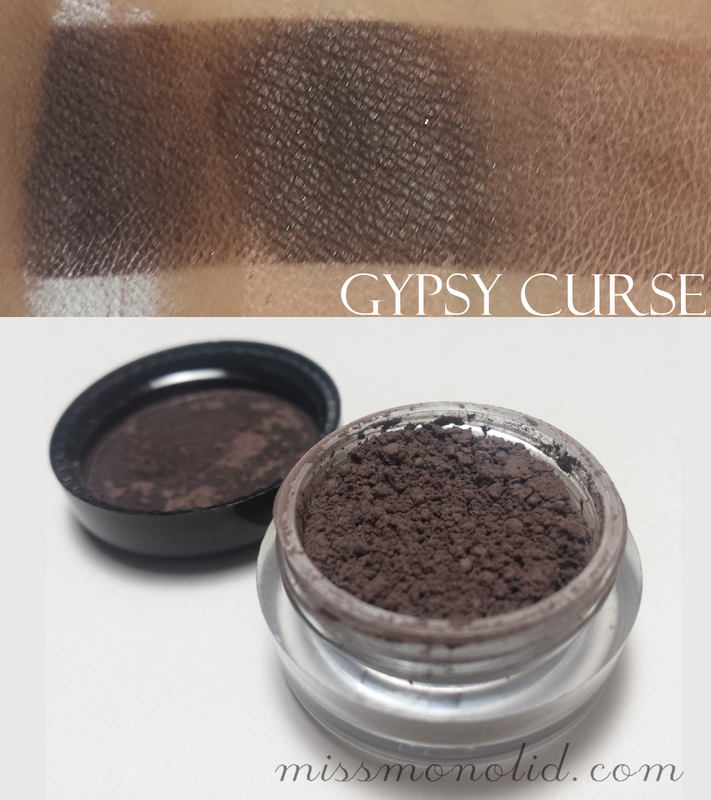 In the beauty blogger package, I received a full size of Gypsy Curse, described as a warm-toned taupe, which is exactly the type of taupe I asked for in the notes! Swatch and container of Gypsy Curse. Click for larger image. 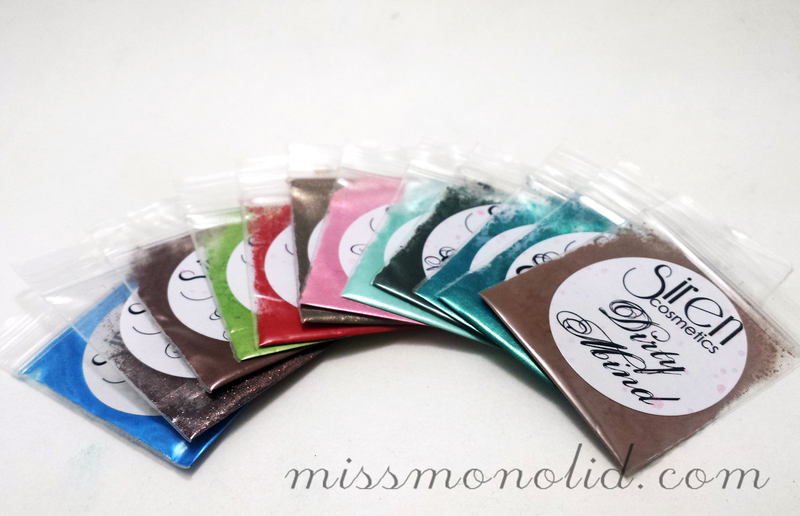 I also received samples of Hesitant Heroine, Stripper Zombie, Dust to Dust, Rain on Cold Glass, Garmonbozia, Teacher in Tweed, and Quiet in the Dark, two of which were samples that came with the order. 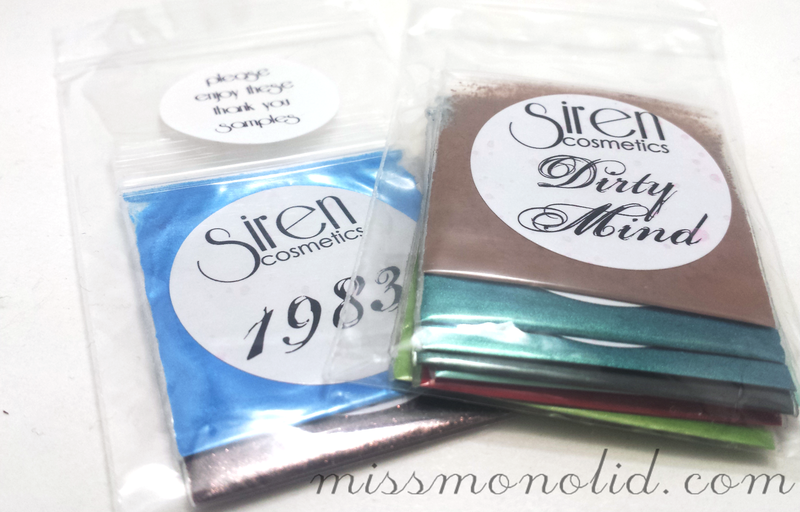 Swatch and baggie of Hesitant Heroine, click for larger image. 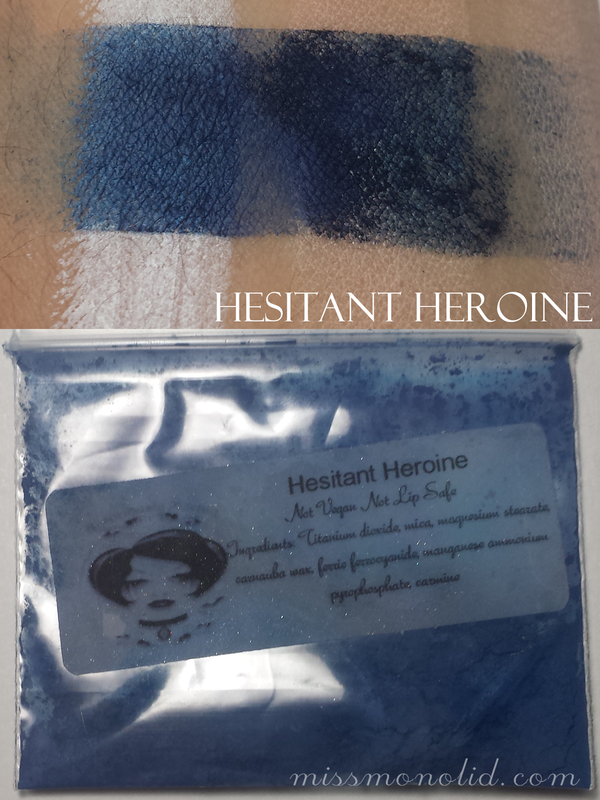 Hesistant Heroine is described as a "A deep sapphire blue with an indigo tone in a matte finish." I'm hesitant to use this with pixie epoxy again. 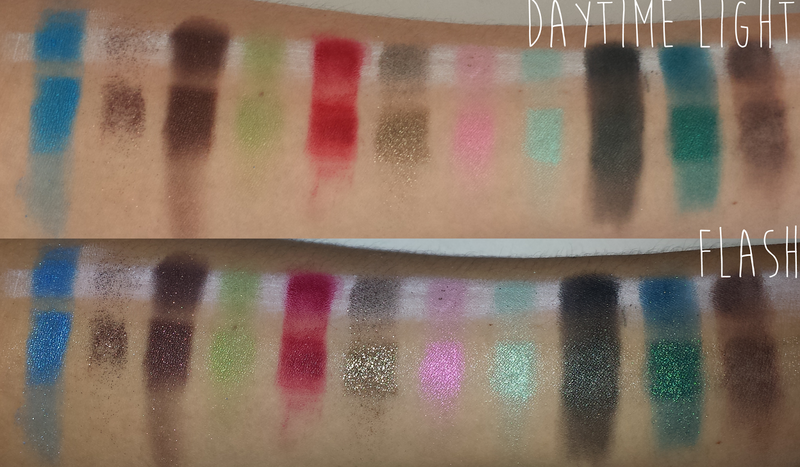 Swatch and baggie of Stripper Zombie, click for larger image. Stripper Zombie is described as a "A sour apple green with a gold duocrome and packed with gold sparkle." I absolutely adore the name and the description - "She used to take her clothes off for a living, now that she's living dead she strips the flesh right off too!" This was a shadow that I did not ever expect to fall in love with because I don't really do sparkles or green, but my goodness, it is one of the most gorgeous things ever. I absolutely love it and I'm so glad that I got a sample of it. This would be something I would purchase. Swatch and baggie of Dust to Dust, click for larger image. Dust to Dust is described as a "An icy mint green with a gray/bone undertone." This was one of the colors that I had hoped to get after browsing the entire site. It's such a delicate/exquisite looking greymint color that I just have not seen anywhere, I'm very glad to get a sample of this, but I'm not sure if it'll be something I'd buy a full size of. 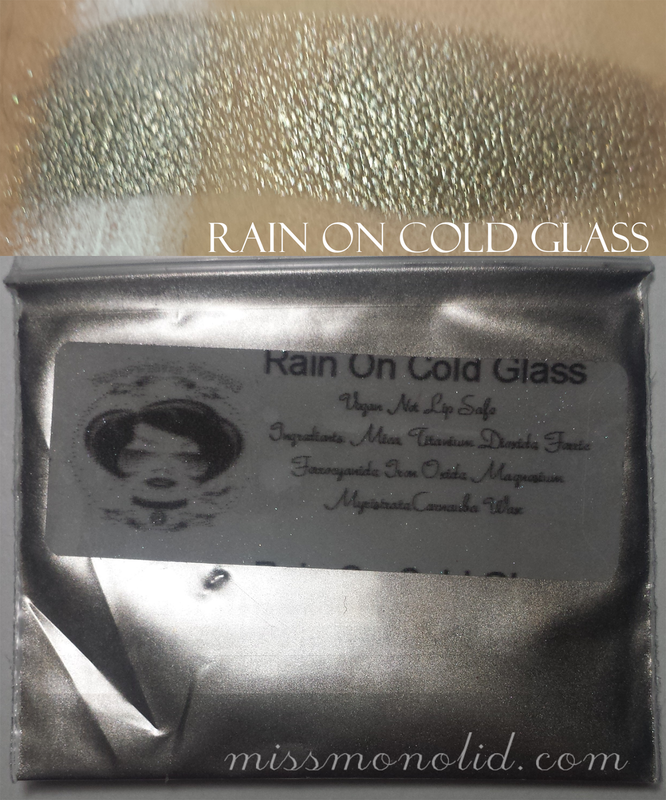 Swatch and baggie of Rain on Cold Glass, click for larger image. Rain on Cold Glass is described as a "A shimmery gold with flashes of blue." This color looked vaguely uninterestingly cold and metallic/steely in the baggie, but when applied, I absolutely loved it - the gold really shows through. I would definitely get a full size of this one, it's perfect for lazy days where I'd just want to put one color all over my lids. Swatch and baggie of Garmonbozia, click for larger image. Garmonbozia is described as a "A creamy corn yellow with a chestnut undertone and a frigid blue shift. The more you blend, the more the chestnut undertone appears. If you are really into unique shades, this one is for you." This one didn't really catch my eye in the bag because it appeared to be this off yellow color with a very apparent blue shift, but my gosh, when applied it is such an intriguing color. I'm so glad she decided to include this sample. I will definitely buy a full sized of this. 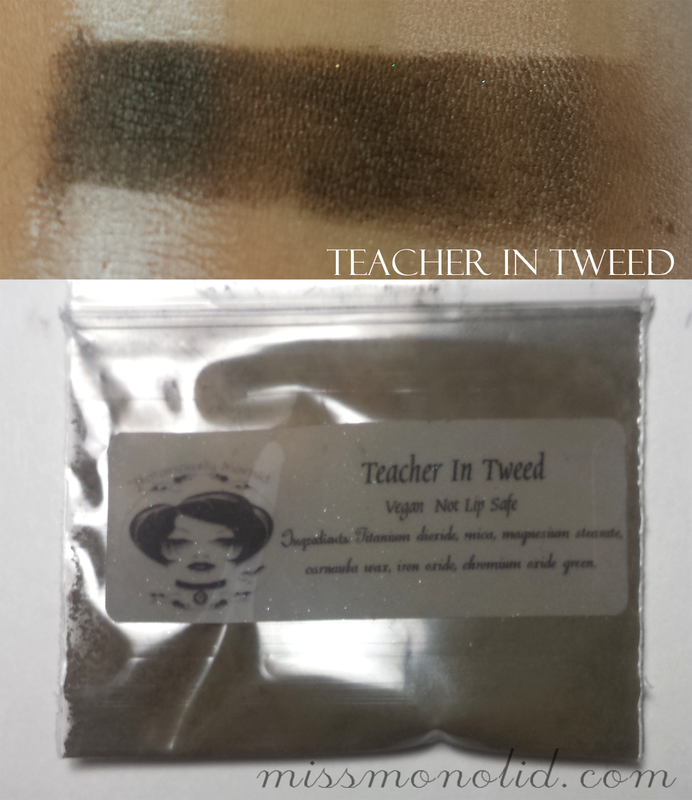 Swatch and baggie of Teacher in Tweed, click for larger image. Teacher in Tweed is described as a "An olive brown that practically screams librarian." Such a good description, it's cooler toned and brown-er than Gypsy Curse, and methinks it'd go great with Rain on Cold Glass. Swatch and baggie of Quiet in the Dark, click for larger image. 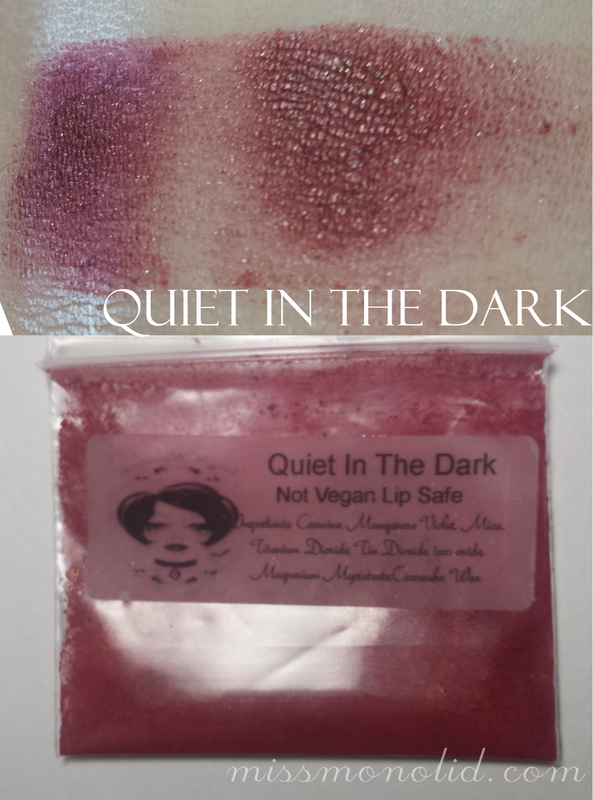 Quiet in the Dark is described as a "A dark rose red with a gold duochrome." I like it, but I'm not quite brave enough to put red in my eye area yet. Maybe someday I'll be bold enough to! Left to right - Quiet in the Dark, Teacher in Tweed, Garmonbozia, Rain on Cold Glass, Dust to Dust, Stripper Zombie, Hesitant Heroine and Gypsy Curse - click for larger image. First column with NYX Milk, second column with ELF Primer + Fyrinnae Pixie Epoxy and third column with ELF Primer only. Swatches were patted on with a brush. As you can see, NYX Milk makes all of them stay better, but Pixie Epoxy reaaally grabs hold of the duochromes and sparkles. I would not wear Stripper Zombie, Rain on Cold Glass, or Garmonbozia without Pixie Epoxy because they look so much more unique with it. I will, however, skip out on the Pixie Epoxy and only go for NYX Milk on the mattes, I'm not that great with PE quite yet and it always makes my mattes look kind of garbled. I will be swatching The Doctor collection and Jupiter Rain in a later post. 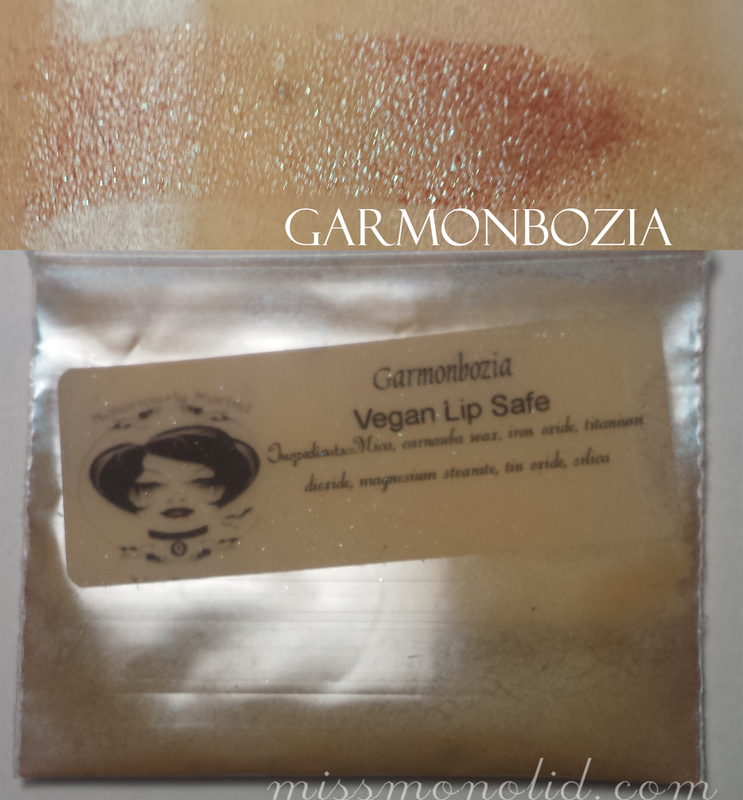 Overall, I really liked the section of colors I was given to sample and Garmonbozia was my favorite out of the bunch. What are your favorites from Notoriously Morbid? Thanks for joining me! Beauty, Drugstore, Lipstick, Maybelline, Spring Be the first to comment! It's finally spring and I'm on a vibrants kick! As I'm slowly transitioning to my low buy, I've started to shop my stash to see what I've glossed over in winter. After looking through, it seems I've neglected these two lovely colors for too long. Shocking Coral and Vibrant Mandarin, opened - click for larger image. Maybelline Color Sensationals Vivids Lipcolor are $7.49 at drugstores and Ulta, so they're priced like other drugstore lipsticks. Drugstores occasionally have BOGO 50% off or 40% off entire lines, so they become even more affordable. Shocking Coral and Vibrant Mandarin - click for larger image. 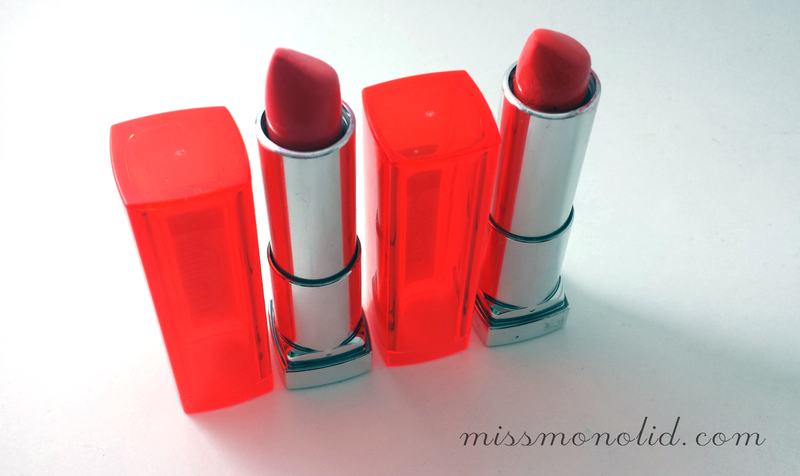 These lipsticks are very vibrant, as you can see in the swatches, and the staying power is not too shabby. In order to make these lipsticks stay on longer, I usually put the lipcolor on, blot, pat it on again, and cover my lips with a tissue while I dust them with setting powder. Swatches on arm - click for larger image. Sometimes I do put gloss on over these lipsticks, as they do have a satin-y matte finish, but that affects the longevity of the lipstick quite negatively, so I don't do it often. I'm more of a mattes kind of gal anyways. Swatches on lips - click for larger image. They're a bit brighter in person, but the camera didn't manage to capture it. I do love these two very much, and I'm thinking about maybe getting the Maybelline Vivids in Brazen Berry, only when it's on sale though! What are your thoughts on these lippies? Right side. 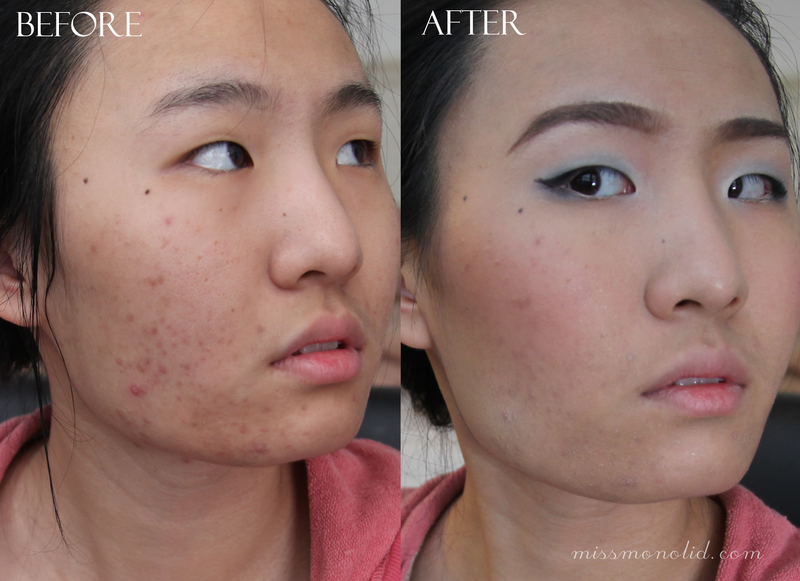 Before - bareface with moisturizer, After - with Laura Mercier Oil Free Supreme Foundation. I had a sample of this, but I didn't like it at all, it does not provide the amount of coverage that I need, and managed to oxidize into an orange-y color in 2-3 hours, I used my Toly Moly Cat Wink Mint Primer underneath the foundation. 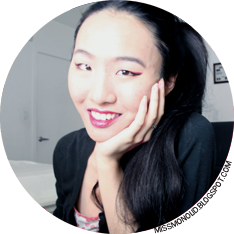 Hi lovelies, I meant to post a review about a week ago, but after assessing the photos, I found it very hard to put up the unaltered pictures of myself (I will never photoshop my face as it will not be representative of the products that I use on it), as my acne, acne scars, hyper-pigmentation and other assorted acne related goodies were very visible. My acne has always caused doubt and slightly low self esteem, I'm no stranger to posting my pimpled bareface on the internet, but this time, I was slightly wary. Sure I had foundation on, and coverup, but even with those thing, my acne would still show through, either with bumps or flakes. 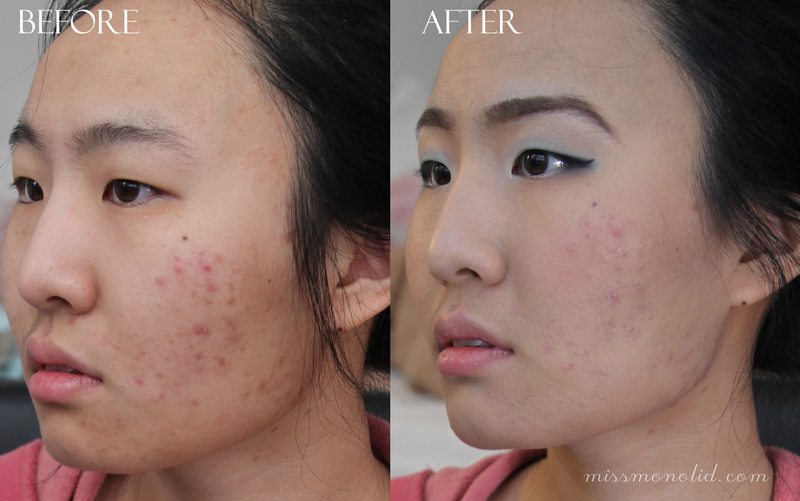 With this post I'd like to explore the issues that come with acne, and the steps that I've taken to correct them. Left side. Before - barefaced with moisturizer, After - with Laura Mercier Oil Free Supreme Foundation. As you can probably see, the acne is still rather apparent. Concealer and foundation just don't work very well over flaky, dried acne bumps. My face has not been clear since I hit puberty. I've always been envious of my classmates with flawless skin (although looking back, they might have just been taught how to apply concealer correctly), and felt really self conscious about my own skin. My mother usually didn't wear a stitch of makeup (she donned lipstick for special occasions), and she firmly believed that at that point of my life, education was much more important than that kind of tomfoolery, and therefore left me blundering on the internet for "acne cures". Do not put lemon juice or unscented cat litter on your face. Explained below. Believe me when I say I've tried all the tricks in the proverbial book, everything from lemon juice to unscented cat litter (oh the naïveté). I cringe to recall what my skin has been subjected to, and would also like to take the time say this: PLEASE do not use lemon juice on your skin, or unscented cat litter - it's much more effective to buy a Vitamin C serum than to subject your skin to a pH of 2.0 (healthy skin pH is around 5.5) and much less embarrassing to buy bentonite clay to use as a mask instead of kitty litter. In college, I tried to use birth control for acne (which only made it worst), and begun to use makeup to conceal my acne, but it never went away, and I was still doing stupid stuff to my skin that I saw on the interwebz, but I see the light now. OCM manages to sooth the skin a little, and take off makeup very well. After consulting numerous skincare websites, and /r/skincareaddiction. I am currently utilizing the two step cleansing method (OCM followed by a mild salicylic facial wash), along with a 2% BHA toner, salicylic acid cream, and benzoyl peroxide spot treatment and seeing slight progress. I look forward to updating this blog with pictures of the development, and if I'm successful, what I used to achieve it. Have you dealt with acne? How did you manage to shake free of the curse? Thanks for joining me! Disclosure: All products were bought and paid for by me and reviewed with complete honesty. Beauty, Drugstore, L'Oreal, Lipgloss, Orange Tempo, Spring, Summer, Swatch Be the first to comment! 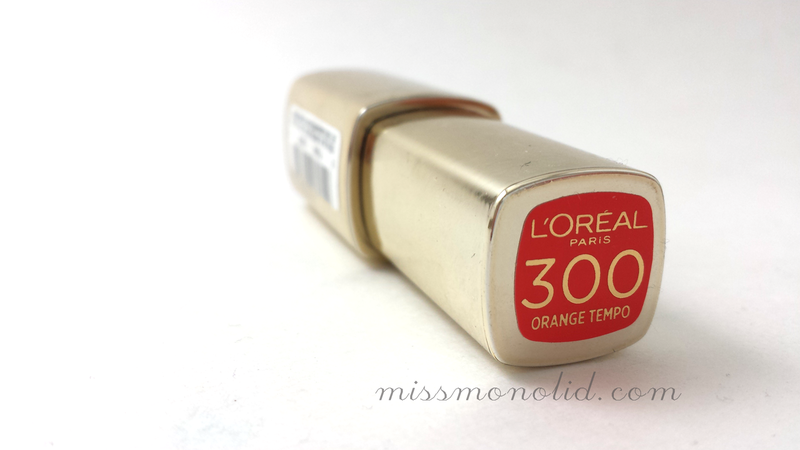 L'Oreal Colour Riche Extraodinaire in Orange Tempo - click for larger image. Hi Blog! Miss me? I've been super busy at work, but the good news is that my supervisor is also a beauty enthusiast! She actually got me this gloss last week, but long story short, I'm super impressed with it! L'Oreal Colour Riche Extraodinaire in Orange Tempo opened - click for larger image. I'm sure we all remember those hair sticking glosses with bad pigmentation which leave much more to be desired from the early late 1990s and early 2000s. This gloss is not like that all, in fact, it's probably the opposite. It is super pigmented, almost wears like a lipstick for me, and I don't feel the need to use a balm before I put it on or exfoliate my lips, which is a definite plus because everyone has those lazy days. 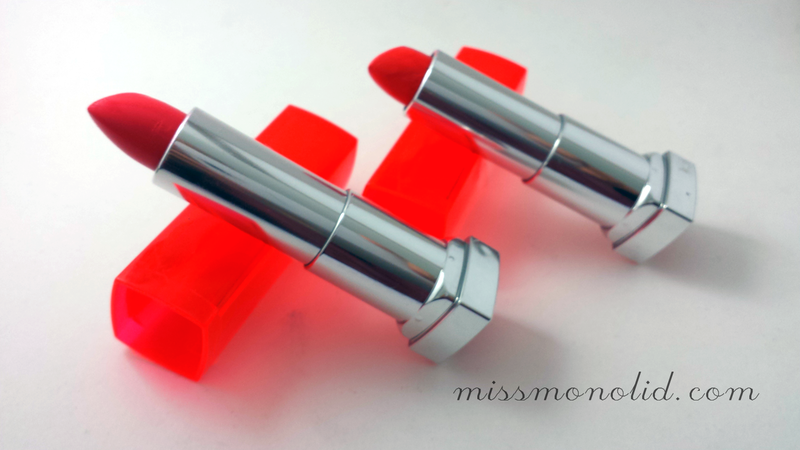 I love the color of this gloss, it's a definite spring/summer color and it's an absolutely gorgeous orange. 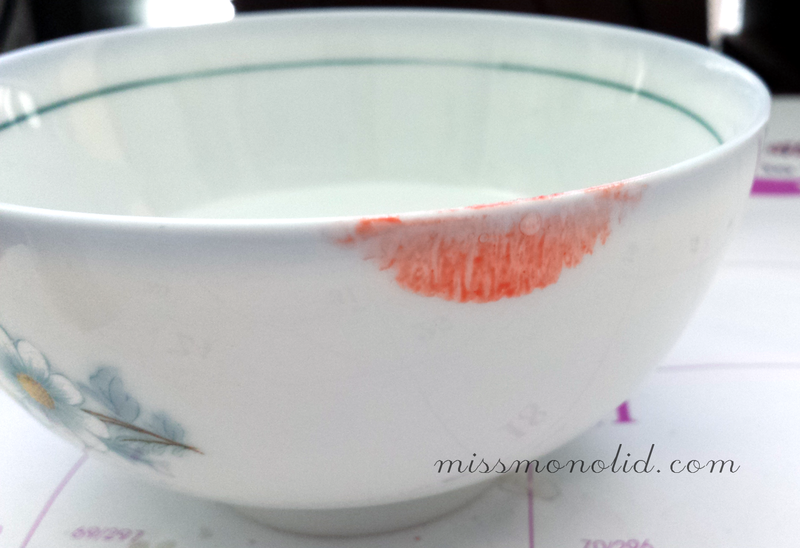 As it is super pigmented, it will stain your lips a little. I find the doe foot applicator a little unwieldy as it's kind of large and short for a doe foot applicator, but, I guess I don't mind it that much, and I can always use my own lip brush. 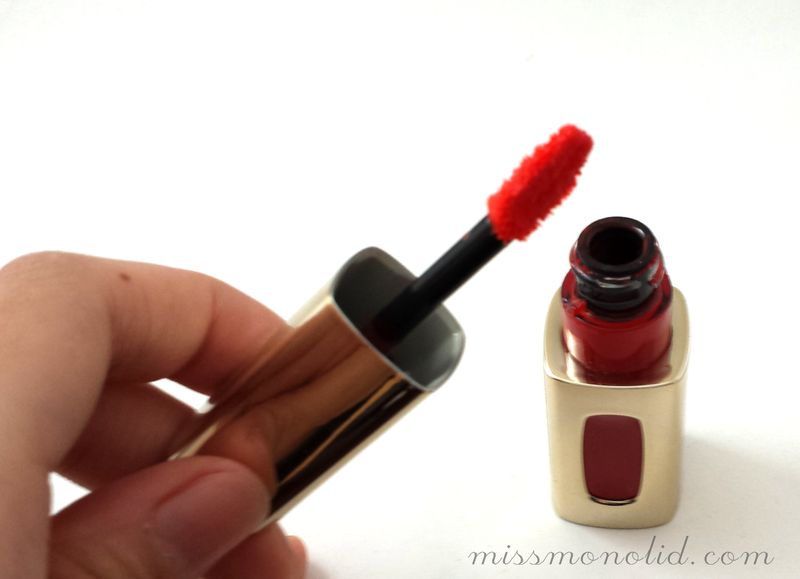 L'Oreal Colour Riche Extraodinaire in Orange Tempo swatched on lips - click for larger image. 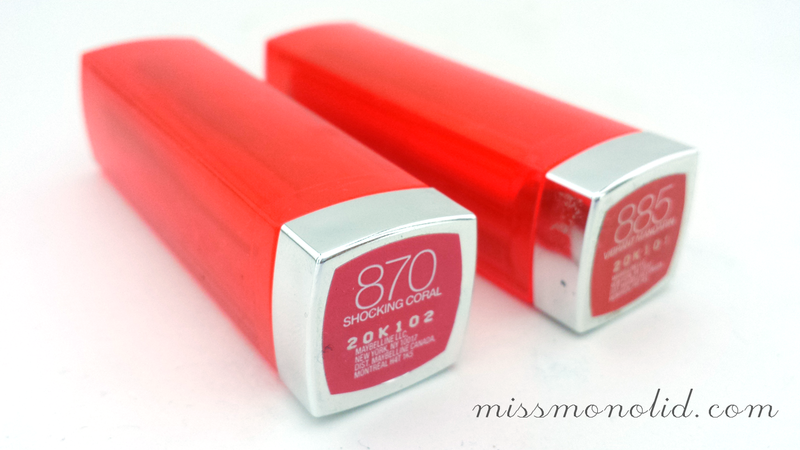 I have worn this gloss over a Maybelline Vivid in Vibrant Mandarin, and I found that it worked out very well. The colors are quite similar, but the Vivid is a little bit lighter/more neon, so when you layer the gloss over the lipstick it makes the gloss seem a little more vivid. 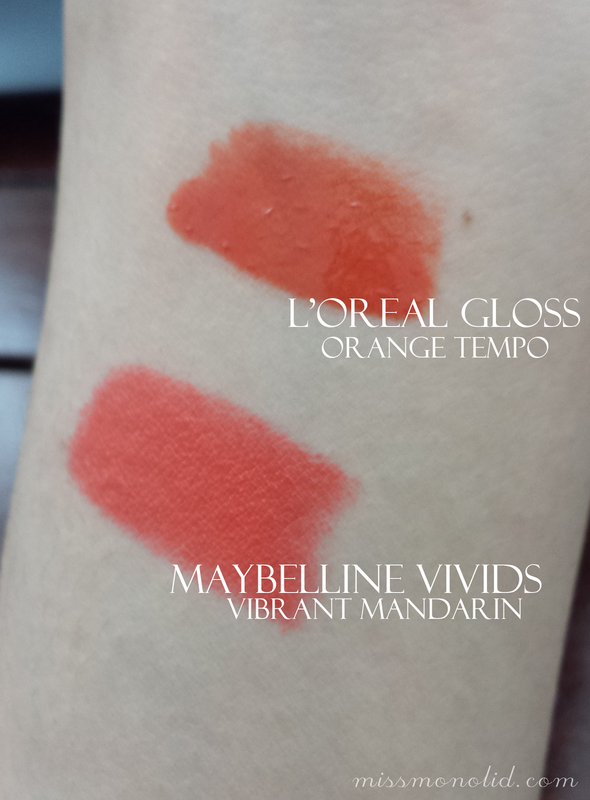 L'Oreal Colour Riche Extraodinaire in Orange Tempo and Maybelline Vivids in Vibrant Mandarin swatched on wrist - click for larger image. The staying power is nice, but like all glosses, it's going to leave marks on your significant other, your cup, or just about anything you put your lips on. Yes, it does leave marks..
All in all, I'm definitely impressed in this gloss, and will definitely look for more! Have you discovered a new favorite recently? 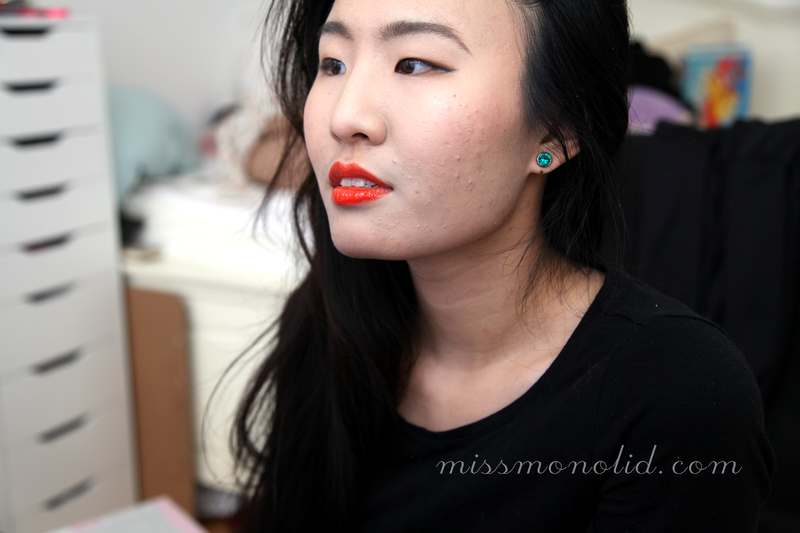 FOTD with Orange Tempo - click for larger image.